Mix gram flour with water (Around 50ml) and make dough. Transfer this dough into a greased chakli press. Add ghee into a pan and heat it. When oil is hot, lower the flame and press the gram flour dough into the ghee. 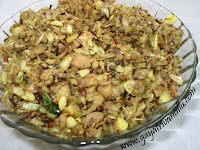 Increase the flame to medium and fry the karapoosa till slightly crisp but has not changed its color. Take the fried karapoosa into a plate and allow it to cool. Make karapoosa with the remaining dough as mentioned above and cool. Crumble the karapoosa with fingers and break into small pieces. Take a dry mixie jar and add the crumbled karapoosa pieces and grind to a fine powder. Sift the ground powder using a large holed sifter to get evenly powdered mixture. Grind the coarse mixture left in the sifter again and get the fine and evenly ground mixture. Keep the mixture aside till use. Remove outer covers and make powder of the cardamom seeds. Take grated jaggery in a bowl and add 65gms of water. Heat the jaggery mixture and cook on high flame till the jaggery is dissolved and bubbles appear. Strain the mixture to remove any impurities. Transfer the mixture back into the bowl and heat it. Then lower the flame and cook stirring till a full one thread consistency is achieved i.e., between112oC & 115oC on candy thermometer. Then switch off the flame and add cardamom powder and mix. Then add powdered gram flour mixture and mix. Transfer the mixture to a mortar and pound it with the pestle till the mixture becomes uniform and soft. Smear some ghee on palms. While the mixture is still warm, take a portion of the prepared mixture and form smooth ball. After taking a portion of the mixture to form ball cover it to retain the warmth. Similarly make balls with the warm mixture and spread in a plate to cool completely. Serve the tasty bandar laddus to near and dear and enjoy. Do not fry the karapoosa till it changes color as the taste and look of the laddus differ. Frying the karapoosa in ghee gives a great shelf life along with a nice aroma than frying in oil. Grinding the fried karapoosa is somewhat difficult as it oozes oil and would not grind to a smooth texture. So it is important to sift (with a large holed sifter) to get even texture. 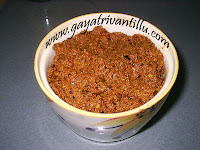 Attaining the thread consistency for jaggery syrup is important to bind the gram flour mixture. If the syrup is just sticky and has not reached one thread consistency then the laddus does not shape well---that means they appear like flat discs. If the syrup is cooked further and is more than one thread consistency stage then it becomes difficult to shape the laddus as on cooling it turns into powder soon. So cook jaggery syrup consciously on low flame till good one thread consistency is reached. While pounding, the mixture attains smoothness as the hot syrup and the gram flour mixture becomes a uniform mixture. But it would be difficult to pound the mixture as the mixture is sticky and the pestle would not come out of the mixture so easily. Pounding gives the smooth texture. Pound the mixture to the extent that one should be able to make laddus. While pounding as the mixture becomes a uniform mixture it thickens. Do not pound the mixture to the extent it becomes dry and then it would become difficult to make laddus. Remember to make laddus while the mixture is warm—so cover the mixture while making laddus to retain the warmth. With the measurements given above it makes 6 big sized laddus. As the measurements are given for a small quantity it would not be that difficult to pound the mixture---it hardly takes 5 to 6 minutes to pound the mixture. These laddus are also known as Tokkudu Laddus as we pound the mixture using a mortar and pestle. Pounding is called TOKKATAM in Telugu and hence the name Tokkudu Laddu. These laddus are famous in Bandaru (Machilipatnam) a place in Andhra Pradesh. In Machilipatnam they make these Tokkudu laddus using jaggery instead of sugar. Taste slightly differs in both the cases and both types have a unique taste. Laddus made with sugar are slightly sweeter than the ones made with jaggery. Make and serve these tasty laddus whatever may be the occasion.